Welcome to my new site. While I’ve had this domain all along, it’s been bouncing to a blog for the past six years and it was finally time for an upgrade. This new home (courtesy of the good folks at Loudbaby.com – the architects behind the Detroit arts-mag I used to run) brings along my existing archives and among other things, also incorporates the once-separate wiki I had for resources around my comics and education course. With the imminent launch of Unflattening – interviews and reviews are starting to appear. First up, Kaitlin Mulhere wove together a thoughtful and thorough interview for Inside Higher Ed. In addition to interviewing me, she also spoke with my advisor Ruth Vinz, my editor at Harvard University Press Sharmila Sen, and James Sturm of the Center for Cartoon Studies. I thought it made a compelling narrative for the significance of this sort of work in academia. From the article: “Sousanis’s book is both a demonstration and defense of the power of visual literacy.” And a quote from professor Vinz, “Is the dissertation a ‘pathway’ to a degree or a pathway to further understanding, meaning and knowledge… a pathway to sharing with others what one is learning?” I think this speaks strongly to the conversations I’ve been a part of focused on reframing how we construct knowledge from Sweden to CUNY. Check out the full interview is on Inside Higher Ed’s site here. Also this week, the first review of Unflattening, and it’s a starred one from the venerable Publishers Weekly! As very few people have seen the entire book as a whole yet, that made this deeply insightful review all the more meaningful to me. Excerpted below and on Publishers Weekly’s site here. 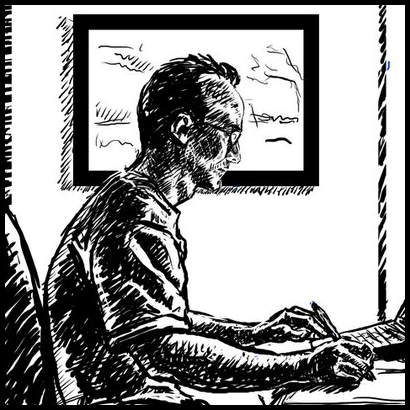 In the meantime, as we continue to get settled here in Calgary, I’m in the midst of a relatively short new comic – a collaboration with author Ian Williams, who is the current writer-in-residence at the University of Calgary. I bumped into Ian walking down the halls of the English department, and suddenly we were working on this piece. Since the piece was intended for a web-only publication, we started with the idea of doing what Scott McCloud terms an “infinite canvas” comic. The story more or less emerged from the design constraints we put in place. As the idea grew, the piece grew, and it’s now six inches wide and about four feet long, and somewhere over 200 panels (depends on how you count them). I’ve drawn most of it, but I’m sharing it here just as the abstract color blocks. While our intended goal was web-only, I think the abstract nature of it needs to be seen all at once to be fully appreciated, so this might mean an accordion print or something along those lines down the road. The final piece will be in the newly founded Toronto magazine Partisan.